NEW! 'Bella Alba' Condo at Sapphire Bay w/Views! Welcome to 'Bella Alba,' an incredible 1-bed, 2-bath vacation rental condo at St. Thomas' Sapphire Bay. Watch the beautiful sunrise from the dining room window while sipping your coffee in the morning or let the warm ocean breeze in for a tropical awakening. Nestled in the Sapphire Bay Condominiums West, this property allows access to the shared pool, tennis courts, and tiki bar, while the second-floor location offers you oceanfront luxury and a view of the most beautiful beach on St. Thomas. Come enjoy the beautiful crystal blue waters of Sapphire Bay at 'Bella Alba.' This pristine condo is located in the gated Sapphire Condominiums West community with 24-hour security and beachfront access! Find relaxation waiting in the airy living room complete with a flat-screen TV with Roku, surround sound and DVD player. There's also has a queen-sized Tempurpedic Murphy bed for additional guests to enjoy a comfortable night's rest. The kitchen comes fully equipped with all your essential appliances and utensils for dining in. The pantry stays stocked with spices, coffee, tea, adult beverages and a few condiments. Retire in the paradisal atmosphere of the master bedroom, outfitted with a king-sized bed and flat-screen Roku TV. Rinse off in the en-suite bathroom, featuring a spacious walk-in shower. Wake up to marvel at the view of luscious manicured grounds and nature-filled ponds when you walk down the stairs to the beach! There's no better accommodation than Sapphire Condominiums West - boasting beachfront access with a bar, occasional live music, rentals for many water activities, and a lovely beach attendant to provide condo guests beach chairs for lounging. 'Bella Alba' is also conveniently located just 1 mile from the popular town of Red Hook, where you'll find a multitude of restaurants, plenty of shops for gifts as well as a few large grocery markets, family-friendly activities, and the ferry terminal for a day trip to the neighboring islands. 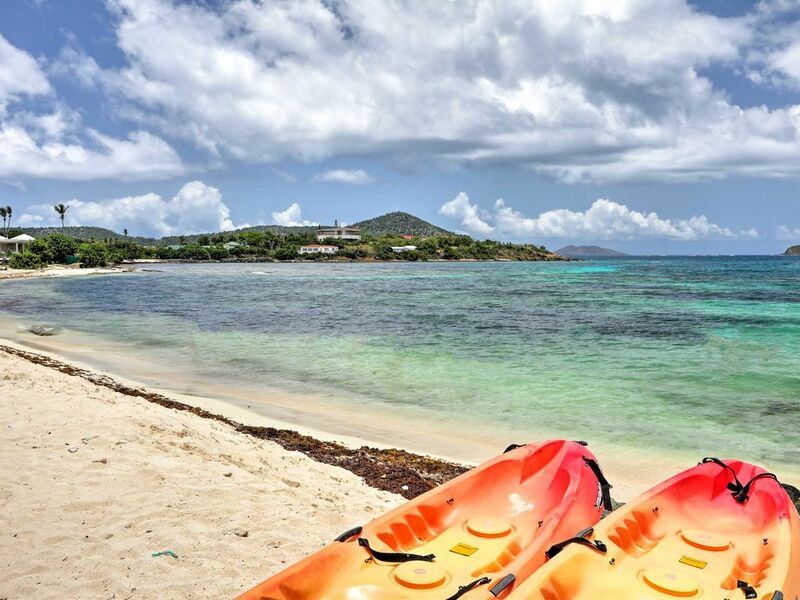 Accessibility to all these great attractions and more on St. Thomas island is easy! Car rentals, taxi services, or taking the $1 bus that leaves from the end of the driveway are all convenient transit options. - Impressive St. Thomas location on the eastside - Walk to Sapphire Bay, Crystal Cove, and Sapphire Beach Marina, 1 mile from Red Hook with shops, markets, and a ferry terminal servicing other islands! We enjoyed this condo as it was bright and just steps to the beach. It’s easy to find and feels like home. The 2 bed/2 bath was great for privacy when it comes to a couple and another person. The only reason we gave it 4/5 stars is because the ac in the master bedroom is fairly loud and there wasn’t a packet or booklet that covers tourist info like reccommended beaches/ places to eat. We did speak to the owner about this the first day and she said someone must have taken it. Maybe keep some extra copies of the papers stapled so that it’s easy to replace if that happens. Otherwise, zero complaints! Nice condo, wonderful beach and view. We'll be back! The rental has everything you need, even Roku TV. No problems at all. Norma was wonderful. Stayed for a long weekend and loved the condo and walkability right onto the beach. Condo is in a community area that looks out to a tropical green garden/pasture area and view of it crossing into white sandy beach. Great access to sapphire bay marina where we took out Isaacs jet skis and also did a full day Breakaway charter to the BVI. Great quiet, uncrowded beach with beach chairs - loved that! Challenges were just in access to groceries/markets - there is a nice cafe but only open until about 4pm, and we were told the grocery store isn’t walkable (not safe with hills I think), and should taxi - which seemed like a waste over a short trip. Believe the condo does indicate ability to stock food for small fee, which is fair and probably worth considering, but it seemed grocery store was going to be closer/safe to walk. With that in mind, it might be helpful in the future to have condo offer just a few minor basics like extra sunblock, soda/juice and a few snacks. Overall though, not a huge deal - just something to keep in mind! Great stay overall, would absolutely recommend! Location, beaches, and the unit we stayed in were great. Our thanks to the owners of C34 for everything.